On this date in 1797, a president of the floating republic was put to death by an empire of the lash. The occasion brings us to the era of Great Britain’s protracted war with Revolutionary France. That war’s essential factor from the British point of view was the navy — crewed in its turn by an immiserated working class, sometimes forcibly impressed, and drawing pay on a schedule that had been set in 1658. In April 1797, after a wage grievance was dismissed out of hand by the Admiralty, the crew of the Channel Fleet mutinied at Spithead, near Portsmouth. For “mutiny” here, think less H.M.S. Bounty* and more labor strike: keeping discipline within their ranks, they used the leverage of refusing to put out to sea to successfully negotiate that pay rise, as well as the transfer of some distasteful officers who went otherwise unharmed. The Spithead mutiny contributes no execution to our pages. This hostile caricature of the Spithead mutineers nevertheless depicts — however incredulously — the common sailors’ degree of organization. However, in its waning days in May, a sympathy mutiny ensued at the fleet lying at an anchorage at the mouth of the Thames, called the Nore. These Spithead and Nore mutinies are generally taken together since they had the same grievances … but their resolutions were very different. The Nore mutiny, less united and disciplined than that at Spithead, saw several ships at Nore mutiny and elect as their leader this post’s principle character, Richard Parker. Parker was an intelligent, veteran sailor with some history of sticking his neck out for better working conditions. He would always insist that he had no part of the mutiny’s planning and was appointed its leader by surprise; whether or not this was so, he exercised his newfound office, President of the Delegates of the Fleet, as best he could. It was a fraught situation; each ship had its own delegates (hence Parker’s title) who did not always agree, and there were radical and moderate factions, and a proclivity among ships inclining to the latter to slip away from the mutinied fleet even as their erstwhile comrades fired upon them. But the most perilous function demanded of Parker was to present mutineers’ demands to the Admiralty, whose perspective was that the fleet’s complaints had already been disposed of via Spithead — especially when the Nore demands expanded to include peace with France. The mutiny collapsed, and Parker was marched to Maidstone Prison to the jeers of Londoners. The president then briefly addressed himself to the prisoner. He said that, notwithstanding the enormity of the crimes of which he had been found guilty, on the fullest and clearest evidence, yet the Court, in order to afford him the necessary time to expiate his offences, and to make his peace with God, would then not name any day for his execution, but leave that point to the determination of the lords of the admiralty. The prisoner then withdrew, and was soon put in irons. The time of his execution was fixed for Friday, the 30th of June. 1797. At eight o’clock in the morning a gun was fired on board his Majesty’s ship L’Espion, lying off Sheerness garrison, Vice-Admiral Lutwidge‘s flagship, and the yellow flag, the signal of capital punishment, was hoisted, which was immediately repeated by the Sandwich hoisting the same colour on her foretop. At half past eight he was told the chaplain of the ship was ready to attend him to prayers upon the quarter-deck, which he immediately ascended, uncovered: at his first entrance on the deck he looked a little paler than corn mon, but soon recovered his usual complexion; he bowed to t lie officers, and, a chair being allowed him, he sat down for a few moments: he then arose, and told the clergyman he wished to attend him: the chaplain informed him he had selected two psalms appropriate to his situation; to which the pris oner, assenting, said, “And with your permission, sir, I will add a third,” and named the 51st. He then recited each alternate verse in a manner peculiarly impressive. 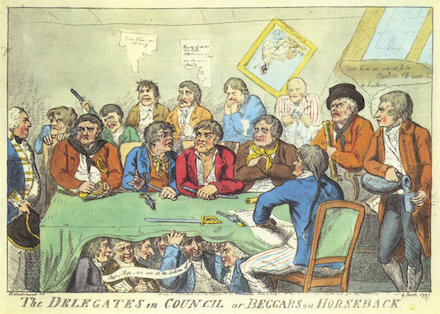 He then requested a minute to collect himself, and knelt down alone, about that space of time; then rose up and said: “I am ready.” Holding his head up, he said to the boatswain’s mate: “Take off my handkerchief (of black silk); which was done, and the provost-marshal placed the halter over his head (which had been prepared with grease,) but, doing it awkwardly, the prisoner said rather pettishly to the boatswain’s mate, “Do you do it, for he seems to know nothing about it.” The halter was then spliced to the reeve-rope: all this being adjusted, the marshal attempted to put a cap on, which he refused; but, on being told that it was indispensable, he submitted, requesting it might not be pulled over his eyes till he desired it. He then turned round, for the first time, and gave a steady look at his shipmates on the forecastle, and, with an affectionate kind of smile, nodded his head, and said “Good-by to you!” He now said, “Captain Moss, is the gun primed?” — “It is.” — “Is the match alight?” — “All is ready.”– On this he advanced a little, and said, “Will any gentleman be so good as to lend me a white handkerchief for the signal?” After some little pause, a gentleman stepped forward and gave him one; to whom bowing, he returned thanks. He now ascended the platform, and repeated the same questions about the gun. He now ascended the platform. The cap was then drawn over his face, and he walked by firm degrees up to the extremity of the scaffold, and dropped a white handkerchief, which he had borrowed from one of the gentlemen present, and put his hands in his coat-pockets with great rapidity. At the moment he sprang off, the fatal bow-gun fired, and the reeve-rope, catching him, ran him up, though not with great velocity, to the yardarm. When suspended about midway his body appeared extremely convulsed for a few seconds, immediately after which no appearance of life remained. The Newgate Calendar’s illustration of Parker’s execution.